Welcome to Psychedelicatessen, a weekly column exploring the world of cannabis cuisine, including recipes from the great chefs and ganja-preneurs who fuel our appetite for adventure. 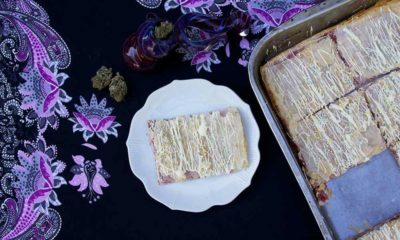 This week we are sharing a recipe from The Official High Times Cannabis Cookbook. Halloween may just be the most counterculture holiday, especially since there’s no need to travel, no formal dinners to stress over, and there are no gifts to buy! Just the pure joy of carving pumpkins, eating candy, planning crazy costumes and getting ready to party all night with werewolves, witches, and Sasquatch. Instead of using that carton of farm-fresh eggs to seek revenge on the mean neighbors who wouldn’t give you candy, why not hard-boil them and create a dish that’s both a trick and a treat?! These devilish eggs are made with cannabis-infused mayonnaise and look like giant bloodshot red eyes – making a fun, gross-out spectacle for your friends to enjoy on their way to a spooky, stony party night! First, you need to hard boil your eggs. Fill a large pot with water halfway. Add a teaspoon of vinegar and a pinch of salt. Carefully add the eggs, avoiding any cracked shells. I place each egg on a spoon and gently dip the spoon into the water, releasing the egg. Bring the water to a boil, then remove the pot from the heat and cover. Let the eggs sit for 10 to 15 minutes. In the meantime, prepare an ice bath, with ice cubes and cold water in a large bowl. Remove the eggs using a slotted spoon and put in the cold water. Let them chill for a moment. Take each egg and carefully crack it all over. Then, add another teaspoon of vinegar and a lot of red food coloring to the cooking water. Put the cracked eggs back in the dyed water and let them soak for 30 minutes. This is will make the eggs look like red, bloodshot eyes. Mayo, one of the French “mother sauces,” originated around 1756, and provides the base for aioli, remoulade, and a host of other dishes beloved by High Times house chef, Ashley Boudreaux. This emulsified sauce relies on about 10 minutes of continuous whisking to properly combine the ingredients, so be patient and add the oil very slowly, literally drop by drop, lest the sauce “break” and fail to emulsify. You can also use a food processor, adding the oil drop by drop through the feeder tube while the processor is running; however, the texture of the mayo is usually lighter when whisked by hand. Be sure to give this recipe a run-through once without the ganja, just to get the feel for proper oil/yolk emulsification, because if the mayo “breaks” with the ganja in it—well, that could be a financial bite. Also, since the eggs in this recipe are not cooked, be sure to get organic, local, farm-fresh eggs, and if such eggs are unavailable, use pasteurized eggs to avoid any risk of salmonella. In a double-boiler, combine the oil and ganja. Heat over low until the ganja smell is pronounced, but not nutty or burnt. (The oil should have an earthy green tint to it.) Let cool. Remove and squeeze the weed. Make sure that all of your ingredients have been brought to room temperature—this is crucial! In a blender (an immersion blender, preferably) or a small metal bowl (use a whisk), thoroughly blend the egg yolk, lemon juice, salt, vinegar and mustard. Using a ¼ teaspoon measure, very slowly add the oil, a few drops at a time, while constantly whisking or blending on low until the mayo is thick and starting to form ribbons. (If it’s too thick, you can add room-temperature water in tiny increments.) If your mixture “breaks,” it can be repaired by whisking some more room-temperature egg yolks in a separate bowl, then slowly whisking those yolks into the “broken” mayo mixture. If that doesn’t do it, add a few drops of hot water. Cover and chill; it’ll keep for about four to five days. Stones 12 to 14. Next, peel the eggs, and carefully slice them in half lengthwise. Prepare the filling by mixing the egg yolks, mustard, cannabis-infused mayo, red food coloring, shallots and hot sauce. Mash up the filling until it has a smooth consistency, then carefully fill the eggs. Sprinkle paprika, salt and pepper over the eggs, then top each with an olive slice. Voila! Now you have stoned, red eyed Halloween deviled eggs. Stones 12.